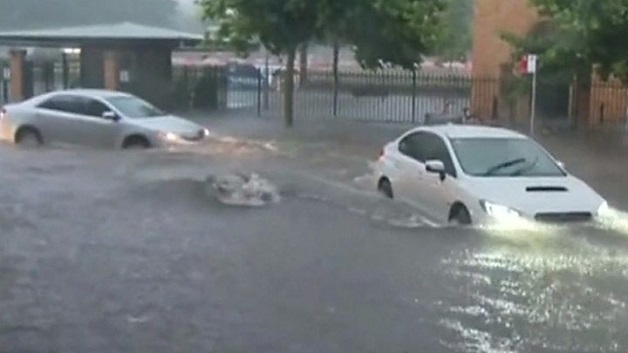 Sydney, Australia has been deluged by the heaviest November rain it has experienced in decades, causing flash-flooding, traffic chaos and power cuts. Heavy rain fell throughout today, the city at one point receiving its average monthly rainfall in two hours. According to BBC News, officials said dozens of vehicles crashed in the stormy conditions, with winds of up to 55 miles per hour also recorded. At least two deaths have been blamed on the storm. A 14-year-old boy died in a car accident in Thornleigh, in the north of Sydney this morning. While a volunteer with the state’s emergency service also died while out on duty, and two police officers were injured after being hit by a falling tree while trying to help Sydney motorists.